Adeline’s memoir reveals that her love of reading began at an early age and continued into her later life. She does not recall learning poems or rhymes at her first school ‘The Cottages School’, but once she starts attending ‘The Council School’ her adoration of literature becomes a main topic in her memoir. She writes, ‘I do remember being introduced to some beautiful poems in the council school. Perhaps they are not appreciated now but I loved them, The Slaves Dream, The Brook and The Revenge. These are some of them. I loved poetry and I loved stories. 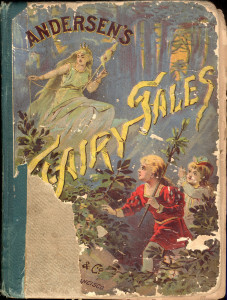 Greek fairy stories and Hans Andersen’s to start with’. We can see from the way in which she lists these books that they have not strayed from her memory and were obviously important texts in her young life, presumably read in the late 1900s and 1910s. Similarly she lists books she received as ‘prizes’ from Sunday school, ‘I remember some of the books quite well. My ‘Basket of Flowers’, ‘The last of the Mohicans‘, ‘What Katy Did‘, ‘The Log Cabin’, ‘Children of the New Forest‘, ‘Bachelors Buttons’ and some I don’t remember at present‘. Adeline clearly finds great pleasure in reading and it could be described as one of her main ‘hobbies’ that feature in her memoir. It has become clear to me that Adeline’s love of reading stems from her education and the books she was offered there. For example; receiving books as prizes from Sunday school, being given library books at the ‘Council School’, and at the ‘Upper Standard School’, she writes, ‘Our head mistress encouraged us to read many of Mrs Henry Wood’s books’. This ‘encouragement’ can be contrasted with her mother’s opinions on reading and literature. Adeline writes, ‘I loved them (books) but mother wasn’t keen on reading ‘trash’. All books were ‘trash’.’ She later goes on to write, ‘A hard backed book a ‘proper’ book as mother called it was just tolerable but not this ‘trash’. We would be better employed knitting or sewing’. This opens the debate on what is classed as ‘good’ and ‘bad’ literature as we see here that Adeline’s mother is under the impression that the stories Adeline has been given or encouraged to read are ‘trash’. James Hinton wrote that Mass Observation diarists in the late 1930s-40s were, ‘anxious to deploy a taste for high culture as a means of distinguishing themselves from their self-assigned class’ (‘The “Class” Complex’, 2008). Could this be related to how Adeline’s mother does not want her children reading ‘trashy’ literature such as ‘The Red Letter’? As Adeline writes: ‘they took in a lot of weekly books like ‘The Red Letter’. These had stories in weekly installments like ‘The Life of Mary Ann Cotton’ or ‘Mary Martin and the Red Barn’. The girls used to talk about them and wait for the next issue with great anticipation. They would have passed them on to us but mother would never allow them in her house’. I believe James Hinton’s idea can be applied to Adeline’s mother’s opinions because a ‘hard backed book’ is seen as a ‘proper’ book in her eyes but she would not allow magazine-type literature in her house. This could be to present a higher class status. Adeline does address her mother’s and her own contrasting opinions on literature as ‘progression’ in times. She writes, ‘You see how times change and progress. I read a good deal when my children were young. Stories at bedtime, and rhymes and jingles were great pleasures’. This shows Adeline’s understanding that her mother viewed domestic tasks as more important than reading but that this was a necessity in the past to maintaining a good household. Catherine Feely writes, ‘Readers are also people, whose encounter with a particular text cannot be divorced from their individual histories, other reading and wider experiences. Books by themselves do not change lives. The accumulated experience of life, however, can change the meaning of books’. Feely’s notions of how life experiences shape the reading of literature can be applied to Adeline’s memoir as it includes poems and quotes from famous writers to ‘sum up her thoughts’ and express her emotions. The entwining of literature and real life are shown in Adeline’s writing, for example, ‘”Oh that my tongue could utter/The thoughts that arise in me” Tennyson said this in his poem ‘The Brook’ so if he thought himself inadequate who am I to grumble? So I shall just continue in my simple way’. 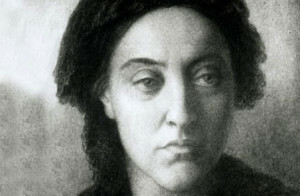 She also writes, ‘Christina Rossetti says, “A man’s life is but a working day,” how true that seemed for him. He gave his life for his job’. This is written in relation to her late husband, Ben, and how he passed away. Adeline’s choice to include passages of poetry and quotes from literature that she can relate to make her memoir all the more interesting and beautiful to read as it shows a deep personal relationship between the writer and the text. Feely, Catherine. ‘From Dialectics to Dancing: Reading, Writing and the Experience of Everyday Life in the Diaries of Frank P. Foster’, History Workshop Journal, 69 (2010) 91-110.